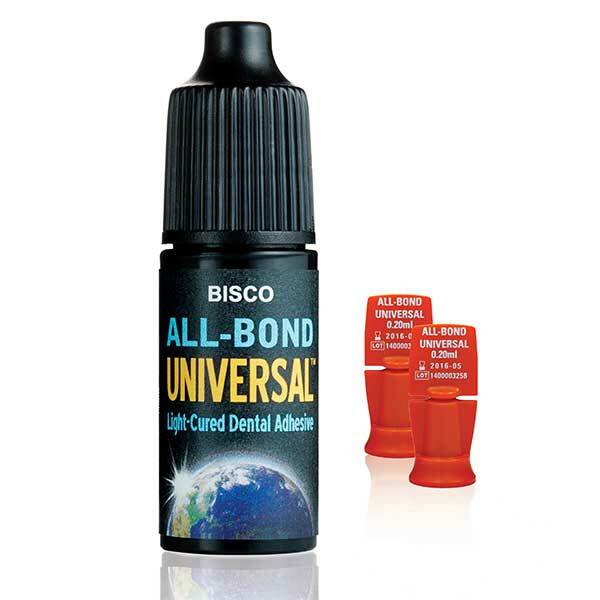 Combining etching, priming, and bonding, BISCO created ALL-BOND UNIVERSAL, an ethanol/water-based dental adhesive that bonds to dentin, as well as cut and uncut enamel. ALL-BOND UNIVERSAL can be used with both direct and indirect dental restorations and will bond to all indirect substrates. It addition, it is compatible with all composite and resin-based cements without the need for an additional activator. With virtually no postoperative sensitivity, ALL-BOND UNIVERSAL offers consistent and effective performance for nearly all direct and indirect restorations. I have been a fan of Bisco products for decades, and the newest addition to their line up, All Bond Universal, is one great product. I have been using it since it's intoduction, and it is an easy to use, superior product. It is easy to apply, works well, with superior bonding and minimal sesitivity. I am a big fan of All-Bond, and of Bisco in general. I use All-Bond in conjunction with Filtek composite for most of my everyday restorations. Been using it for years, and I agree with Gregory "no waste". easy to use no waste fast efficient great reliability.. I have been using All-Bond Universal for many years. Without question it is the best bonding agent I have ever used and it is an all in one product, making it even more convenient. As such there is no waste, so you get more of a bang for your buck. Considering it is priced lower than most comparable bonding agents, as are most Bisco products, I give this product my highest endorsement. Easy delivery, universal application, predictable bonding and no sensitivity....the only bonding system you need in your office. i like that it doesn't need to be in the fridge ! I've been with Bisco from the beginning throughout the spectrum of adhesion transformation. I hate change...and although skeptical am very pleased with the past few year's results, versatility and ease of use. I don't trust any self-etch system on uncut enamel. I've used this under full etching conditions and has been a proven player. I cycled through several bonding agents before a colleague suggested I try All-Bond and it has pretty much solved all my bonding issues. I use it for composites and CEREC crowns and it's been easy to use, effective and I've had no issues with debonding or sensitivity. Highly recommend it. Thank you for your submission. We will review this answer. You will be notified once your answer has been published.